The Maryland State Department of Education has established a set of desired learning outcomes. These outcomes specify what students should know, be able to do and how they should act as a result of their educational experiences. These learning outcomes are explicitly stated in the Common Core standards. The Huber Child Development Center considers Maryland State Department’s requirements when choosing curriculums for our programs. The Comprehensive Curriculum of Basic Skills along with skills pulled from the Common Core standards are used for the 3 Year Old Program. By using these combined curriculums along with assessments, we are able to see the overall strengths and weaknesses of our students and plan for their academic needs. Our Pre-Kindergarten class (4 Year Old Program) is also in alignment with the Common Core Curriculum. Open Court is used in the Pre-K Program for literacy and our math program is based on Common Core standards. 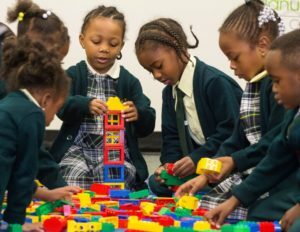 Pre-Kindergarten students also participate in resource classes such as: Art, Music, Computer Literacy, Library, Christian Education and Spanish. Students who attend the Center participate in theme/curriculum related field trips. When we have trips, the students in out 3 Year Old Program must be accompanied by an adult chaperone.